It’s entirely possible that almost everyone in Fauquier County knows Elizabeth Lawrence. A Fauquier native and one of six children, her family was heavily involved in the community as she grew up. And as an adult, even more people know her as the front of the Elizabeth Lawrence Band, where her throaty vocals and powerful voice that evoke powerhouse singers like Bonnie Rait and Susan Tedeschi, lead the group in playing popular hits by blues and rock artists as well as original songs of their own. 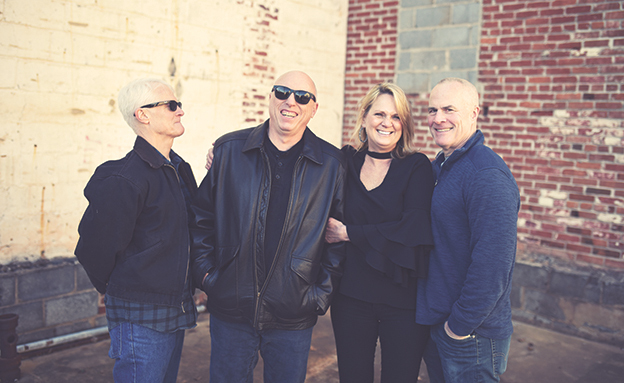 Her rock-solid band, also known as “ELB,” is comprised of Elizabeth on lead vocals and three other talented musicians: Joe Cody on guitar and backup vocals, Jeff Cody on electric bass guitar, and Sven Bridstrup on drums and backup vocals. Although the band members had known each other for years before ELB was formed, Joe was the one who took the initiative to approach Elizabeth. Joe remembers, “I was personally kind of tired of the loud rock band thing, and I asked Elizabeth, ‘If I got a band for you to do all the stuff you want to do, would you be up for it?’” Elizabeth recalls, “We were all in different projects that overlapped, and Joe thought it would be a really great matchup.” So, together with Joe’s older brother Jeff on bass and Sven on drums, they put together an award-winning band that has been entertaining audiences of all ages in Fauquier County and beyond for more than a decade. Elizabeth was born and raised in Casanova, and her parents still reside in her childhood home. Most of her siblings still live near Fauquier County and have close ties to the community. One reason Elizabeth enjoys living in Fauquier County is that she loves the small-town feel. She explains, “This community’s been very good to me. I just love it here. I think it’s a great place to raise my daughter.” Even though Elizabeth has lived outside of Fauquier County, she has always been drawn back and considers it home. Elizabeth started singing when her mother would take her to choir practice at church. She remembers, “When I was about 15, the church would ask me to sing as the cantor. Then people would hear me sing and hire me for weddings.” Elizabeth’s mother was also a talented singer and was part of the Sweet Adelines, an all-women musical group formed in 1945 that was committed to keeping the musical art form of barbershop harmony alive. Over the past few years, Elizabeth has collaborated with two groups local to Warrenton, the Piedmont Symphony Orchestra and the Silver Tones Swing Band, and has shared her powerful voice as a guest singer. In 2016, Elizabeth performed a solo with the Piedmont Symphony Orchestra in their high-energy rock show, backed by the full symphony orchestra and accompanied by PSO’s rock ensemble. In December 2017, Elizabeth was a featured vocalist at the Silver Tones Swing Band’s holiday swing dance in Marshall. ELB is community-minded and has donated performances to many local venues, including St. John’s Catholic Church, the Town of Warrenton’s First Friday celebrations, and Verdun Adventure Bound. 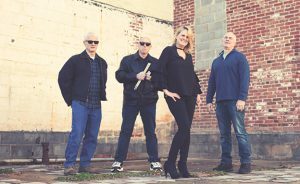 Almost monthly, you can hear the band at Warrenton local hot spots Molly’s Irish Pub on Main Street, McMahon’s Irish Pub on Lee Highway, or at the Griffin Tavern in Flint Hill. Elizabeth has a long history playing at Molly’s and has performed there since they opened their doors in 2001. Elizabeth and other ELB members consider Molly’s their “home base” and a favorite venue. Molly’s owner, Casey Ward, says, “The Elizabeth Lawrence Band is a talented group of artists, who are extremely down to earth, always have a great vibe about them, and always bring in an amazing crowd.” Although most of the band’s performances are local, ELB has travelled as far as Front Royal, Winchester, and Richmond to share their music. ELB drummer, Sven Bridstrup, took his first music lesson when he was eight years old. He played all through high school and has been in various bands since 1980. While serving in the U.S. Army, Sven played in the Army Fife and Drum Corps at Fort Myer. Before joining ELB, Sven played and made recordings with many local bands. When not playing with ELB, Sven works for the FAA and has put in 31 years. “Elizabeth is one of the best singers I’ve ever heard. I just love playing with Elizabeth, Joe, and Jeff. They are all really good, and we get along. We all kind of like the same kind of music,” Sven explains. Originally from Ohio, Sven came to Warrenton in 1980 after joining the Army. He says he loves Warrenton, and he and his wife hope to retire here. “We love the town. You walk down in Old Town, and there’s people walking around, with all the great shops and great restaurants.” When Joe recruited Sven for the band, he knew that Sven’s drumming style would be a perfect fit. He recalls saying, “I think I know a guy who can play…he’s played in the Army band and all through high school. He’s this ‘super musician guy’…and he sings, too!” ELB rehearses in Sven’s basement, where he has installed the full-size Foundation Recording Studio. Elizabeth cites her musical inspiration as artists Bonnie Rait, Susan Tesdechi, and Koko Taylor. Her “throaty vocals” echo these popular singers. Another female vocal inspiration is Aretha Franklin. Elizabeth says, “From the time I could speak, I could sing Aretha.” At the 2018 Summer on the Green concert series with the Allegro Community School of the Arts in downtown Warrenton, ELB performed an Aretha Franklin tribute with a medley of famous hits by the Queen of Soul. Although the band started by featuring only Elizabeth on vocals, over the years they have incorporated vocal harmonies into their music. These multi-part vocals add depth and richness to the band’s sound, and Joe, Jeff, and Sven all join in, depending on the song. “We make sure to find songs that can feature backup vocals because the guys are great singers,” says Elizabeth. At ELB shows, you’ll hear many favorite rock and blues hits. When the band finds a song they want to bring to audiences, they sit down and figure out an arrangement to perform. “Joe, Jeff, and Sven are all incredibly well educated in music theory. They arrange songs for the band. They’re brilliant; they’re like mathematicians. Their music theory background really comes in handy,” Elizabeth explains. Each show that ELB brings to the stage is different, and they vary their musical lineup of songs at each venue. The band members have written and produced some original songs, and play many favorite “cover” charts made famous by artists such as Tedeschi, Rait, Elvis Presley, Pink Floyd, The Rolling Stones, and Fleetwood Mac. When asked about their original music and how it’s created, Elizabeth says, “Typically, Joe comes up with a riff and we come up with ideas and produce the rest of the song and the lyrics. I’m heavy on the lyrics, and he’s heavy on the music. But it often starts with a riff.” She continues, “It’s a collaborative effort. Joe will create most of the music, and Jeff and Sven will write the bass and drum parts to match. They are all so very talented.” Some original ELB song titles include “Miss You Haze” and “Home.” Another is “Put Your Tears Away,” the genesis of which originated with Joe, who based the song on the things his little girl would say to him before bedtime. “Home” was inspired when Joe was travelling to California and became homesick for Virginia.